The chapter is dedicated to the first part of the development method associated with the strategic layer in the abstraction layer model introduced in Chapter 1. 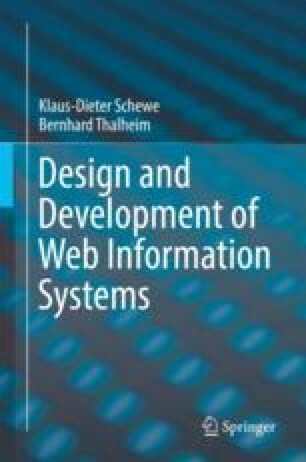 As such it emphasises the strategic modelling of web information systems (WIS). This covers first the general characterisation of a WIS by a mission statement and brand, a utilisation space regarded from content, functionality and context angle, a utilisation portfolio addressing the actors involved and their goals and tasks, the utilisation context, and the desired atmosphere, which will impact on layout and playout. Second, the chapter addresses strategic analysis covering linguistic and communication aspects; in particular, word fields, message analysis and metaphors are used in this context.